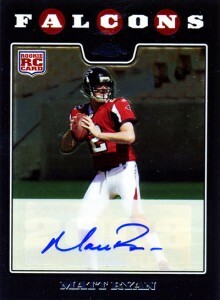 Topps Chrome Football Rookie Autographs might not be the most valuable cards a player has. But not everyone has a shot at pulling something from National Treasures, Exquisite, Five Star, Flawless or any of the hobby's ultra high-end products. Topps Chrome fills a void similar to Panini Contenders. With wax boxes available at reasonable levels, the popularity of Topps Chrome autographs can be measured in their widespread appeal. Given how popular they are, it's almost hard to believe that the first Topps Chrome Football Rookie Autographs were included until 2006. In the years since, the cards have become an annual cornerstone of the football card season. While any Topps Chrome autograph of a key rookie is coveted, it's Chrome so the Refractors create lots of extra buzz. Like it or not, the rainbow has become a trademark for the brand. Given the ongoing popularity of Topps Chrome Football Rookie Autographs, we've compiled a list of the ten best covering 2006 to 2013. Much of the rankings are based on realized prices for base versions. However, when prices are similar, factors like current play and overall hobby momentum had to be taken into account. Matt Ryan has been at the helm a couple of times for the Atlanta Falcons, poised to bring them over the proverbial hump. He's also been on a team that's been downright awful. Despite the yo-yo mentality of ups and downs, Ryan has been one of the league's better quarterbacks for much of his career. 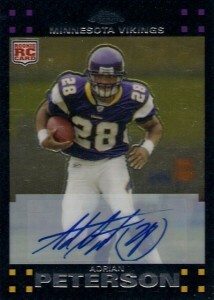 While not prohibitively expensive, it's up there enough to rank on our list of the top Topps Chrome rookie autographs. Promise and flashes of brilliance -- that's much of the talk surrounding Nick Foles. At least it is when he's healthy. 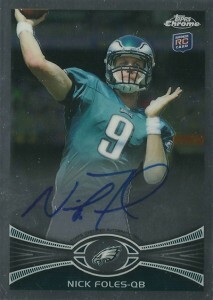 One of several high-profile rookie autographs in 2012 Topps Chrome Football, collectors seem to be leaning more towards the promise given the strong prices the card is now garnering. 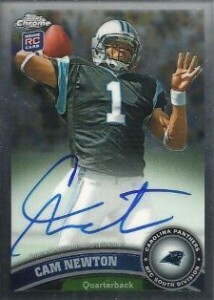 When 2011 Topps Chrome Football first came out, Cam Newton was the clear-cut top choice. That was saying something given the quality of the 2011 rookie class. But after a dominant first season, Newton hasn't been quite the same. And while this is still a strong option, it's no longer the best in the set. Matthew Stafford might be at a turning point in his career. Which way he goes, his 2009 Topps Chrome autograph will follow. Entering the league as a number one pick, Stafford was greeted by the hobby with plenty of hype. Even without a lot of success on the field with the Lions, there was the thought the Lions would eventually build a winning franchise. That hasn't happened and time might be running out. Outside of Stafford's play, the story of this card is how tough it has become to find. When the RG3 show debuted, the quarterback was almost neck-and-neck in the hobby with Andrew Luck. This continued for much of the season as the two quarterbacks, along with Russell Wilson, gave collectors one of the top rookie classes in the modern hobby. And then disaster struck. A major injury and poor play since has coaches and collectors starting to second-guess the 2011 Heisman Trophy winner. It's still early in his career, but right now there are more questions surrounding Griffin than answers. And that's dragging this, and all of his cards, down. 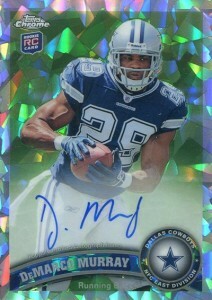 While the 2012 Topps Chrome Robert Griffin III autograph is slipping, the 2011 DeMarco Murray is rising fast. As the starting quarterback for the Dallas Cowboys, Murray has never been a hobby secret. However, he was often running in the shadows of the Tony Romo circus and Dez Bryant. But 2014 has been a breakout year for DeMarco Murray. He's not only one of the NFL's premier running backs, he's become one of its biggest stars. Despite this card's high slot, there are still a lot of questions surrounding its lasting appeal. Given Peterson's high-profile off-field troubles, a lot of fans have been turned off of collecting the running back. But not all of them. 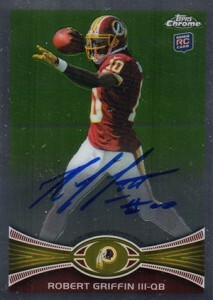 Tough to find today, this is still one of the top Topps Chrome Football rookie autographs on the market. Will it find redemption or will it fall off the radar? That's something only time can answer. 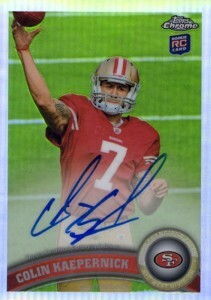 When 2011 Topps Chrome Football first came out, Colin Kaepernick was one of the set's secondary signatures. Fast-forward a year and Kaepernick was leading San Francisco to a Super Bowl appearance and his cards were on fire. While there's understandably not the same momentum, Kaepernicks Topps Chrome Rookie Autograph isn't just the best in the set but nearly all of them for the brand. 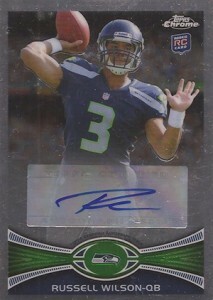 Inserted in packs as a redemption, the 2012 Topps Chrome Russell Wilson autograph is, unfortunately, on a sticker. That hasn't stopped it from being one of the top Russell Wilson cards from his rookie season. He isn't a typical NFL quarterback, but leading your team to a Super Bowl in your second season does wonders for one's cards. 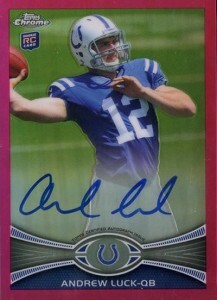 As soon as it was released, the 2012 Topps Chrome Andrew Luck autograph became an instant collection cornerstone. And while it wasn't cheap initially, it has considered to grow in popularity and price. With so few on the secondary market, it looks as though collectors are holding out waiting for Luck to lead the Colts to a seemingly inevitable Super Bowl over the next few years. The base version can be found with both an on-card signature and as a sticker. Refractors appear to all be hard-signed. 2006 Topps Chrome Kellen Clemens #225 AUTO Rookie RC BGS GEM MINT 9.5 .5 away! Very surprised Tebow didn’t make the list. 2011 Cam Newton Topps Chrome RC Auto Refractor # 99! MINT! Carolina Panthers!